Both the open source NGINX software and NGINX Plus are very secure and reliable as web servers, reverse proxies, and caches for your content. For additional protection against access by unauthorized clients, you can use directives from the Secure Link module to require that clients include a specific hashed string in the URL of the asset they are requesting. In this blog post, we will discuss how to configure the two methods implemented in the Secure Link module. The sample configuration snippets protect HTML and media playlist files, but can be applied to any type of HTTP URL. The methods apply to both NGINX and NGINX Plus, but for the sake of brevity we’ll refer only to NGINX Plus for the rest of the blog. The Secure Link module verifies the validity of a requested resource by comparing an encoded string in the URL of the HTTP request with the string it computes for that request. If a link has a limited lifetime and the time has expired, the link is considered outdated. The status of these checks is captured in the $secure_link variable and used to control the flow of processing. As mentioned, the module provides two methods. Only one of them can be configured in a given http, server, or location context. One use case for this method is when a user uploads an image or document to a server for sharing but wants to prevent anyone who knows the filename from accessing it until the official link is published. The second, more flexible, method is enabled by the secure_link and secure_link_md5 directives. Here the encoded string is an MD5 hash of variables defined in the NGINX Plus configuration file. Most commonly, the $remote_addr variable is included to restrict access to a particular client IP address, but you can use other values, for example $http_user_agent, which captures the User-Agent header and so restricts access to certain browsers. Optionally, you can specify an expiration date after which the URL no longer works even if the hash is correct. The Secure Link module is included in prebuilt open source NGINX binaries from nginx.org, the NGINX packages provided by operating system vendors, and in NGINX Plus. 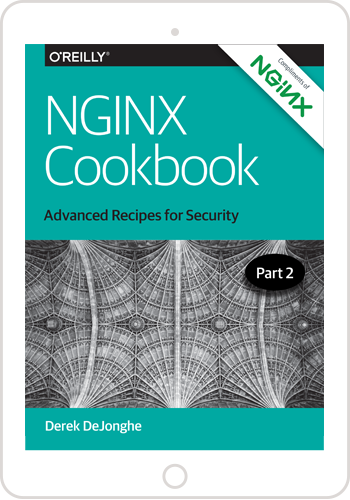 It is not included by default when you build NGINX from source; enable it by including the --with-http_secure_link_module argument to the configure command. The more basic way to secure URLs is with the secure_link_secret directive. In the following sample snippet, we secure an HTTP Live Streaming (HLS) media playlist file named /bunny.m3u8. It’s stored in the /opt/secure/hls directory, but is exposed to clients using a URL that starts with the videos prefix. The hashed string comes right after the prefix, which is an arbitrary string without any slashes (here, videos). The part of the URL that follows the hash, here hls/bunny.m3u8. The parameter to the secure_link_secret directive, here enigma. If the client’s request URL does not have the correct hash, NGINX Plus sets the $secure_link variable to the empty string. The if test fails and NGINX Plus returns the 403 Forbidden status code in the HTTP response. Otherwise (meaning the hash is correct), the rewrite directive rewrites the URL – in our example to /secure/hls/bunny.m3u8 (the $secure_link variable captures the part of the URL that follows the hash). URLs beginning with /secure are handled by the second location block. The root directive in that block sets /opt as the root directory for requested files and the internal directive specifies that the block is used only for internally generated requests. For a discussion of generating hashes programmatically, see Generating the Hash Programatically. The following sample curl commands show how the server responds to different secured URLs. The more flexible method for securing URLs uses the secure_link and secure_link_md5 directives. In this example, we use them to allow access to the /var/www/files/pricelist.html file only from clients on IP address 192.168.33.14 and only through December 31, 2016. Our virtual server listens on port 80 and handles all secured HTTP requests under the location /files block, where the root directive sets /var/www as the root directory for requested files. The secure_link directive defines two variables that capture arguments in the request URL: $arg_md5 is set to the value of the md5 argument, and $arg_expires to the value of the expires argument. The secure_link_md5 directive defines the expression that is hashed to generate the MD5 value for the request; during URL processing, the hash is compared to the value of $arg_md5. The sample expression here includes the expiration time passed in the request (captured in the $secure_link_expires variable), the URL ($uri), the client IP address ($remote_addr), and the word enigma. If the hash in the URL sent by the client (captured in the $arg_md5 variable) does not match the hash calculated from the secure_link_md5 directive, NGINX Plus sets the $secure_link variable to the empty string. The if test fails and NGINX Plus returns the 403 Forbidden status code in the HTTP response. If the hashes match but the link has expired, NGINX Plus sets the $secure_link variable to 0; again the if test fails but this time NGINX Plus returns the 410 Gone status code in the HTTP response. Now let’s see how a client calculates the md5 and expires arguments to include in the URL. The first step is to determine the Unix time equivalent of the expiration date, because that value is included in the hashed expression in the form of the $secure_link_expires variable. To obtain the Unix time – the number of seconds since Epoch (1970-01-01 00:00:00 UTC) – we use the date command with the -d option and the +%s format specifier. The client includes this value as the expires=1483228740 argument in the request URL. The openssl md5 command with the -binary option generates the MD5 hash in binary format. The openssl base64 command applies Base64 encoding to the hashed value. The tr commands replace the plus sign ( + ) with the hyphen ( - ) and the slash ( / ) with the underscore ( _ ), and delete the equal sign (=) from the encoded value. The client includes this value as the md5=AUEnXC7T-Tfv9WLsWbf-mw argument in the request URL. If your NGINX Plus web server is serving dynamic content from an application server, both NGINX Plus and the application server need to use the same secured URL. You can generate the hash for the md5 argument in the URL programmatically. The following Node.js function generates a hash matching the one defined in the NGINX Plus config snippet above. It takes an expiration time, URL, client IP address, and secret word as arguments and returns the Base64‑encoded binary‑format MD5 hash. The following sample curl commands show how the server responds to secured URLs. Here’s another example of a secured URL with expiration date, used to protect both the playlist for a media asset and the segment files. One difference from the preceding example is that we add a map configuration block here to remove the extension from the playlist (.m3u8 file) and from the HLS segments (.ts files) as we capture the filename in the $file_name variable, which gets passed to the secure_link_md5 directive. This serves to secure requests for the individual .ts segments as well as for the playlist. Another difference from the first example is that we include the $http_user_agent variable (which captures the User-Agent header) in the secure_link_md5 directive, to restrict access to clients on specific web browsers (for example, to have the URL work on Safari but not on Chrome or Firefox). The Secure Link module in NGINX enables you to protect files from unauthorized access by adding encoded data like the hash of a specific part of the URL. Adding an expiration time also limits how long links are valid, for even greater security.